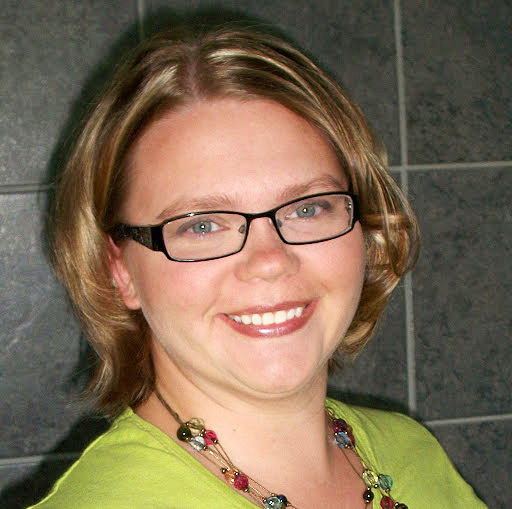 Editor Heidi Marttila-Losure can be reached at heidi@dakotafire.net. invitation to consider coming back to their hometowns someday. Some area communities, including Faulkton and Frederick, have started to give that message to their high school graduates with the gift of a mailbox. The mailbox contains letters from people in the community recognizing what the graduates have already achieved, wishing them well on their journey to gain knowledge and experience, and encouraging them to consider coming back home someday when they want to put down roots. Few people would come right out and say that, and many might not even realize they believe it. But sometimes the unspoken message is the one our young people hear the loudest. Wanting what is best for our children is hard-wired into us. But I think sometimes we haven’t thought very deeply about what that “best” actually looks like. Does that mean making a good living? Does it mean having respect or power? Or something else? “I just want my son/daughter to be happy,” many parents say. The trouble with that wish is that our world does not always yield happiness. If we want to have meaningful relationships, we won’t always be happy. To love is to risk loss. And even if, at the moment, you can be happy in your own home, taking a look outside or in the news may well change your view. Suffering in our world is easy to find. Constant happiness is only possible through willful ignorance. I would suggest, instead, that a better wish for young people is a meaningful life. “(M)any graduates are told to: Follow your passion, chart your own course, march to the beat of your own drummer, follow your dreams and find yourself. This is the litany of expressive individualism, which is still the dominant note in American culture. “Most successful young people don’t look inside and then plan a life. They look outside and find a problem, which summons their life. A relative suffers from Alzheimer’s and a young woman feels called to help cure that disease. A young man works under a miserable boss and must develop management skills so his department can function. Another young woman finds herself confronted by an opportunity she never thought of in a job category she never imagined. This wasn’t in her plans, but this is where she can make her contribution. 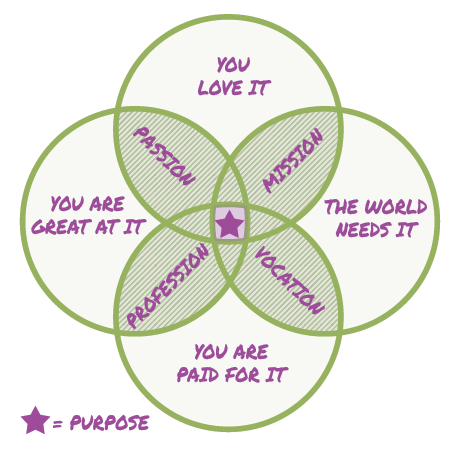 The diagram provides a great visual of how different aspects of a meaningful life are connected, but it’s an idealized vision. The things you love, are good at, the world needs, and you can be paid for are all moving targets; your purpose changes as the other pieces shift and slide. But it shows that your purpose, or the achievement of a meaningful life, doesn’t rest in just doing what pays well, what you love or what you are good at. Deep satisfaction also requires knowing that you are doing work that is needed in the world. And here’s the thing: Many of our rural communities have an abundance of work that needs doing. In many small towns, the list of needed professions could cover a good share of the categories in the Occupational Outlook Handbook. Plumbers, electricians and construction companies have more work than they can handle. Several communities are still hiring teachers several months into the school year. Lawyers are missing altogether from many rural counties. A dearth of medical workers, especially those who provide direct care, has forced some nursing homes to hire crews from other states to come in for a few weeks at a time. On the surface, this doesn’t sound like an obvious selling point for living in rural places. There’s lots of work to do? Really? Who would sign up for that if there’s another option? And probably all of us have chosen the easier path a time or two. But I think that defaulting to the easier choice eventually starts to feel hollow—and many of today’s young people already know this. They are looking for routes to deeper meaning in their lives. They want to do work that is needed and matters in some significant way. The challenge with the opportunities for meaningful work in rural places is that they often aren’t advertised. The retiring veterinarian, dentist or lawyer in a community may not seek a replacement—though the clients who need services don’t disappear just because the provider retires. A dire need for updated housing in many communities means there is room in the market for more construction crews, plus work for architects and other designers. But you’re not going to find those opportunities on any jobs website. If we want our young people to be able to find their purpose in our communities—work that they love, are good at, can get paid for, and that is needed by the world—then we are going to need to make sure they have the skills they need to “create their own opportunities.” Seeing what’s missing in their hometowns is a key first step. But if our unspoken assumptions are directing them to go elsewhere, they may not even look here. And both our kids and our communities would be worse off for it. Editor’s note: This is the second-to-last Prairie Idea Exchange issue! We hope you have enjoyed this series that builds on conversations to take a deeper look into issues that affect our region. If you have input about any of the topics we’ve covered, you are still welcome to go to www.pie4.us to help the conversation move forward. And if you have input about the project itself, I’d love to hear it! We are exploring what we might like to do to build on this work. Please email me with your comments: heidi@dakotafire.net. Enjoy this piece of PIE!